If you are looking for villa rentals in Tuscany then look no further than La Collina del Sole with an award winning pool and views that are like something from a film set. Set in the stunningly beautiful Garfagnana region of northern Tuscany, La Collina del Sole is a jewel among the holiday villas in Lucca, it is a fabulous family home for relaxed summer living. Sitting with a chilled glass of wine in the fabulous infinity pool and gazing at the magnificent and dramatic scenery of Garfagnana can only but take one’s breath away. 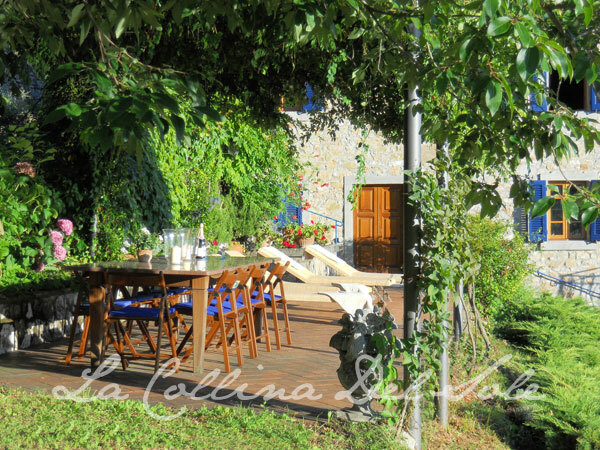 Of the Villas for rent in Tuscany La Collina del Sole is a haven of escapism from today’s busy world and the perfect destination for spending relaxed lazy days in this enchanting yet unspoilt corner of northern Tuscany. For the more energetic and the culture vultures, however, there is plenty to keep you busy if you can draw oneself away from the extraordinary cocoon that is La Collina del Sole. Vineyard visits, mountain hikes, discovering disused marble quarries, Italian villages, and the hidden beauty of Garfagnana can be combined with trips to the nearby coast, Forte de Marmi and the Gulf of Poets whilst the magical city of Lucca with its sophisticated shops, numerous churches and relaxed Italian feel is within easy reach. La Collina del Sole is the much loved home of a British family whose friends always asked them where to rent a villa in Tuscany and is ideal for a bunch of friends or a family with its relaxed and characterful atmosphere. Comfortable and well equipped with fabulous al fresco dining area, guests can enjoy long lazy lunches of delicious Garfagnana products including fabulous pecorino cheese, varied breads, salamis and faro (spelt) salad and in the evenings sitting out on the terrace is a dream as the sun sets over the spectacular Apuan mountain range, unique among Holiday villas in Lucca. It’s hard to draw oneself away from the pool with its Jacuzzi feature and many hours can be savoured here with a book listening to the rippling water and the birdsong beneath the Tuscan sun. Inside La Collina del Sole the living areas are situated on the upper level with open plan living and dining areas leading to the kitchen which is well set up for those guests who enjoy cooking whilst on holiday. Downstairs are the bedrooms, one with en suite bathroom with the other three sharing a spacious bathroom with shower and additional first floor shower room. This villa of all the Villas for rent in Tuscany is ideally suited to five or six people but can accommodate larger groups with, for example, additional teenagers or maybe a grandparent in the party. One can go straight out into the garden from the bedroom areas and the master double bedroom enjoys stunning views to the mountains beyond. With original features throughout only at times seen in other Villa rentals in Tuscany such as beamed ceilings, terracotta floors, Tuscan arches and open fireplaces combined with warm interiors, La Collina del Sole is a welcoming and comfortable home. A fabulous property if you wish to rent a villa in Tuscany for a family holiday in this spectacular and fascinating region of Tuscany, La Collina del Sole is highly recommended and a rare find indeed.